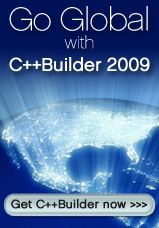 Feel free to place the web banners and links below on your web site to help promote Delphi and C++Builder 2009. There are several different versions of each that highlight either Delphi, C++Builder or the combination of the two and different views of the Earth from North America, Europe and Asia. You may need to click the thumbnails of the long and tall banners to view and download the full sized images. Links that apply to the banners are below each set of images. 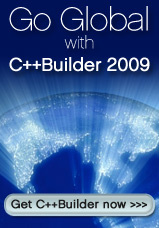 Thank you for supporting Delphi and C++Builder.